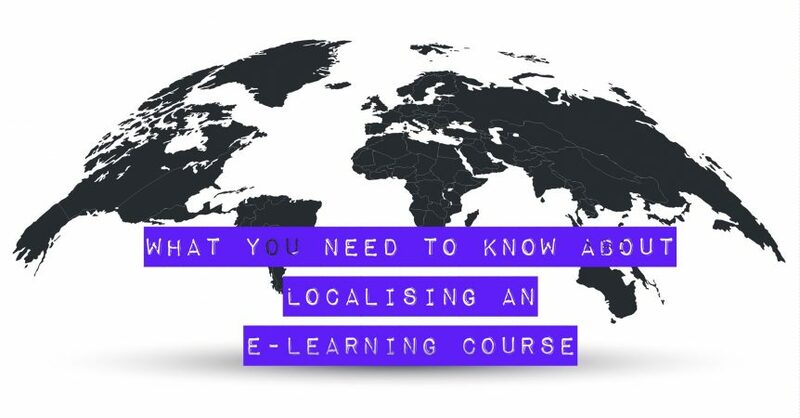 If your e-learning course is for people in different countries and/or people who speak a different language, you will need to localise it for them. The process of doing this is quite involved so it is important you have a good understanding of what localisation means as well as the things you should consider. Firstly, localisation is not just about translating the language. Often, this is an important element of localising an e-learning course, but it is only part of the process. So, if all you do is translate the course into a different language, you risk reducing the impact of the course and not getting the result you want to achieve. Another thing you should remember is the importance of always focusing on the learner. The more relevant you can make the e-learning to a learner in their location, the better your results will be. What Does Localising an E-Learning Course Mean? Translating the course into another language is an important part of most localisation projects. However, you also must think about localising any cultural references in the course. Examples include references to famous people, television shows, songs, brands, places, and more. These references are often included to make the course more engaging and relevant to learners. When the learner doesn’t understand the context, however, because they are from a different part of the world, these cultural references have the opposite effect. The colours you use in the e-learning course can be important too as colours are sometimes perceived negatively in some countries. You will also need to consider local jargon, slang words, and other local phrases. You may also need to localise contexts. For example, you might have a story in your course featuring a woman in Dubai. When you use the same course in a different country, though, you might need to change her name and location. This will help make the story more relevant to the learner. How difficult it will be to localise the e-learning course will depend on the course content. Some courses will be very focused on a specific topic that doesn’t vary much from language to language and culture to culture. An example is an e-learning course on using a software programme. Other courses, however, will require more thought when it comes to localisation. These are typically courses where the topic is more subjective, such as a course on improving sales techniques or leadership abilities. The easiest way to localise an e-learning course is to plan the localisation from the beginning. This is a much faster and more accurate approach than creating the course in one language and only thinking about localisation once you finish. An example is translating an animated video into a different language. With animated videos, the timing of the visual to the voiceover is essential. You might find the translation is too long or short in places, however, which puts the animation out of sync. This is much easier to correct at the start of the process, i.e. before you sign off on the first-language version of the video. You can change the animation slightly so that both languages fit, for example, or make a change to the text so the voiceover is much closer in length. By thinking about localisation from the start, you can plan the development better. Another tip you can use when planning localisation from the start is to ensure all the content of the course is language neutral. You can do this by ensuring it doesn’t contain cultural references, local phrases, location references, etc. What about if localising from the start of the process is not possible. For example, you might have only just expanded into a different region, so the requirement for a localised e-learning course is new. Having editable source files makes this process much easier. Therefore, as a general rule, you should ensure you have access to all editable source files and not just the end product. For example, the visual of a video without a voiceover. Getting the right team to localise the language and other elements is essential too. This includes the right e-learning developer, ideally a team with localisation experience. You also need the right localisation partner. Often, your e-learning developer will have a recommended provider. If not, the main advice is to never use machine translation tools. You should also avoid using third-party providers that use all or partial machine translations. These tools have their uses, but in most e-learning courses, they won’t be effective. Instead, should use a provider that offers human translations, ideally by native speakers. This means they can not only look at the text, but all the other points mentioned above such as cultural references and local slang. As you can see, there are a lot of things to consider when localising an e-learning course. With the right help, however, you will get a course that delivers the results you need in all locations.